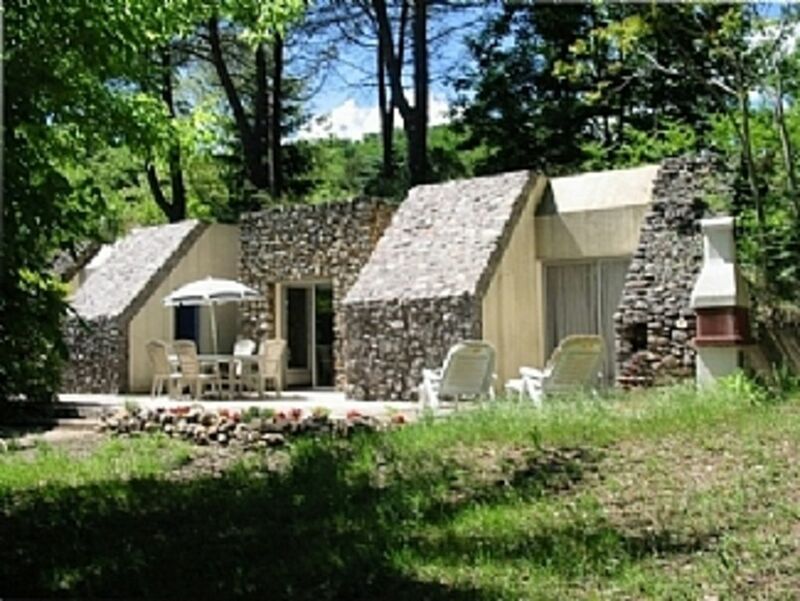 This gite is a fantastic and unique underground house (so it's cool in summer) with its South facing, sliding glass, double patio doors in each room opening onto a large private sun terrace. It is very light and airy. Built in 1975 it has all modern conveniences. Situated in a tranquil location amongst vineyards and wooded rolling hills in a valley only 3km from Le Vigan in the foothills of the Cevennes Mountains. Within 1.5 hours drive of Nimes or Montpellier airports and within a (long) days drive from the Channel Ports via the A75 Autoroute. Retired ex BBC employee now making wine and welcoming guests from all over the world. This is one of the most peaceful and tranquil places in France. The people are welcoming and the weather and food is wonderful. What’s not to like? The shops in Le Vigan are just a short trip, but the gîte is far enough away to ensure privacy. One of the advantages of this property is that as most of the rooms are built into a hill it is cooler in the summer than normal properties, whilst still allowing in plenty of sunlight through the wall-to-wall patio doors in every room. Visits to our winery can be organised at any time. En-suite shower rooms to both bedrooms each with separate wc. Kitchen/living room - washing machine, dishwasher, microwave, fridge/freezer, satellite TV. Notes on accommodation: Electric central heating. Sorry, no pets. Outside: The gite is on a wine producing estate and has a small garden beyond the sun terrace. A large garden table with parasol and chairs are provided on the terrace together with loungers and a barbecue. There are plenty of walks available on the estate. Parking and private tennis court. Utility Room: Iron & Ironing board, Clothes horse. We returned to the Cevennes after many years, seeking the peace and beauty of the landscape; happily we chose to stay in this unique home, the property of Christopher and Claudie, who were attentive and generously helpful hosts. The gite, built into a hill, in the complete privacy of the owner's vineyard, contains three spacious living areas with two en-suite bathrooms, a fully equipped kitchen, laundry, dishwasher--so all modern conveniences. It is furnished simply and comfortably, with warm provincal colors enhancing the spacious tile-floored rooms, each of which open to the large patio. This was the perfect base for our exploration of the gorges, and with great proximity to markets and the town of Le Vigan. The property receives our highest endorsement. Des hôtes très accueillants un logis impeccable en pleine nature. Calme et isolement ce que nous recherchions, avec proximité du Vigan. Nous avons été très bien accueillis par nos hôtes qui ont été très réactifs dès qu'l y en a eu besoin. Ils ont su nous conseiller sur des activités, repas des producteurs au marché , soirée court métrages que nous n'aurions pas trouvé seuls. Ce sont des hôtes charmants. Le gîte est très agréable et confortable et nous a soustrait aux fortes chaleurs extérieures. Mediterranean beaches are just over an hours drive. 50 miles away. It is recommended that cars are hired in advance if travelling by air. The ski station and observatory on Mt. Aigoual are just over an hours drive. Grotte des Demoiselles - a cave of staggering proportions with incredible stalagmites (not for vertigo sufferers). Cirque de Navacelles - an impressive natural feature formed by an immense, magnificent meander in the river Vis, deeply imbedded in almost vertical walls of rock. Bambouseraie - an exotic bamboo plantation founded in 1855. Observatoire du Mont-Aigoual - where, on a clear day, you can see the Causses, the Cevennes, the Cantal range, Mont Ventoux, the Alps, the Languedoc plain,the Mediterranean and the Pyrenees. For the energetic there is white water canoeing and paragliding. Booking Notes: A security deposit of 125 euros is required in case of damage to the property or its contents. The full rental fee and security deposit must be paid by arrival. The gîte must be left as found in a clean and tidy state, failure to do so will result in a cleaning charge of 49€ Changeover Day: Saturday. Depart by 11.00am, arrive after 4.00pm. Notes on prices: Prices are for the property per week in euros. Payments accepted: Cash, Credit card via PayPal or electronic bank transfer. No winter lets.